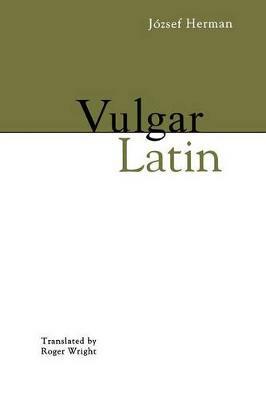 "Vulgar Latin" refers to those features of Latin language that were not recommended by the classical grammarians but existed nonetheless. Although "Vulgar Latin" is not well documented, evidence can be deduced from details of the spelling, grammar, and vocabulary that occur in texts of the later Roman Empire, late antiquity, and the early Middle Ages. Every aspect of "Vulgar Latin" is exemplified in this book, proving that the language is not separate in itself, but an integral part of Latin. Originally published in French in 1967, Vulgar Latin was translated more recently into Spanish in an expanded and revised version. The English translation by Roger Wright accurately portrays "Vulgar Latin" as a complicated field of study, where little is known with absolute certainty, but a great deal can be worked out with considerable probability through careful critical analysis of the data. This text is an invaluable aid to research and understanding for all those interested in Latin, Romance languages, historical linguistics, early medieval texts, and early medieval history. "No other book presents the complexities involved in the developments from Latin to Romance in such a compact synthesis. Vulgar Latin should be one of the standard references for scholars and students interested in the historical development of the Romance languages." "This is an exceedingly useful basic introduction to the subject, and its appearance will be very welcome to anyone who teaches undergraduate or graduate course involving Vulgar Latin." "Undoubtedly the most intelligent and clearly and cogently presented analysis of the whole topic of popular Latin's development that I have ever read. This book has no equal that I know of." "This little book is highly recommended as an essential contribution to our knowledge of the development of Latin and the emergence of the romance languages." "This is a marvelous and definitive book, having been written by one who is an acknowledged master in his field, and translated by a man who is now his equal. Thus two first-class minds come together and their mastery of the subject is conveyed (as true mastery often is) with easy, charming and limpid simplicity. The result is an essential book for specialists, which will also be attractive (mirabile dictu!) to all amateurs of language. . . . This little book is highly recommended as an essential contribution to our knowledge of the development of Latin and the emergence of romance languages."